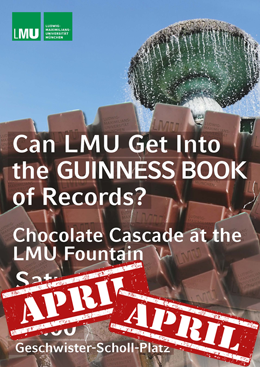 This coming Saturday LMU hopes to get into the Guinness Book of Records. A 12-member team consisting of scientists and technical personnel will try to break the current record for the world’s highest chocolate cascade at the fountain on Geschwister-Scholl-Platz. The experiment was conceived by maintenance-man Florian Waechter and Matthias Hübner, a doctoral student in Chemistry. “The idea occurred to us while we were enjoying chocolate fondue. In the beginning, it was just a madcap scheme – but then we did some background research, and discovered that a group in Switzerland had already tried to set up a world record in the discipline. So we developed the concept further,” says Waechter. The pair quickly assembled a 12-man team, and obtained the necessary permits from from the University authorities and the city fathers. Principal Investigator for the project is chemist Dr. Thorsten Schmid (43), who will supervise the crucial melting step. “The biggest problem we face is getting such a mass of chocolate – 9 cubic meters of the stuff – into a liquid state by exactly 2 o’clock,” he says. “We have carried out pilot experiments in the lab, and worked out the optimal parameters for the full-scale operation with the help of the two physicists on the team.” On the basis of these calculations, a trapezoidal container with a high thermal conductance was chosen for the attempt – and has been filled with chocolate. In addition, the team has fabricated a specially designed supporting frame for the cauldron in the LMU Workshops, to ensure that the contents can be heated as uniformly as possible. LMU President Bernd Huber has agreed to act as patron of the event, and will be on hand on Saturday to get the cascade underway. “As the best university in Germany, LMU is known far and wide for the excellence of its research, but getting into the Guinness Book of Records would be another feather in our cap. I wish the team the best of luck,” he said.